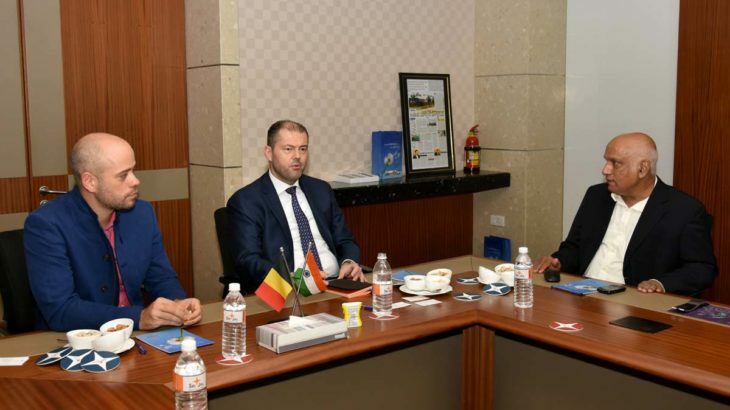 Sri City, May 15, 2018:- Mr. Mark Van De Vreken, Consul General of the Kingdom of Belgium in Chennai accompanied by Mr. Jean-François Aernouts, Trade & Investment Commissioner for Brussels visited Sri City on Tuesday. Mr. Ramesh Subramaniam, President, Sri City Foundation extended a warm welcome and briefed them on the salient features of the mega industrial park, the available investment opportunities and highlighted the specific advantages of doing business in Sri City. The purpose of the visit was to witness the existing infrastructure at the mega industrial park and assess its business potential. During the interaction, they evinced keen interest and inquired on different aspects of Sri City. Following the briefing session, they went around the campus and visited the production units of Vermeiren India Rehab, and Danieli India.